For the first time since Kyler was born, we snuck away for a night. Once again, courtesy of my visiting parents-in-law, "Tayta" and "Jiddo", we had free and very reliable babysitting! The Aria Hotel sits just 100 yards down the road from the US Embassy in Mala Strana - Prague's historic "Little Quarter." Because it's so close to work, I've made many a reservation at the Aria - for others. It's always received good reviews, so we thought we'd give ourselves an early anniversary getaway while the gettin' was good... and the Aria didn't disappoint! The Aria is all about music. When you check in, you're handed not only an electronic key in the shape of a Treble Clef, but an iPod, loaded with hours of tunes. Each floor of the hotel is themed after a different genre of music, and each room is set up in honor of a composer or performer who was instrumental (get it?) to that genre. 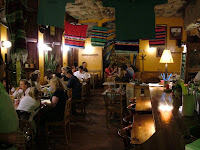 We had the Gypsy Kings room - celebrating Salsa music. Fluffy robes and slippers, down comforters, a PC, and a plasma screen TV made it really easily to settle in for the night. The library downstairs, just around the corner from the home movie theater offers a wide variety of books, DVD's and CD's that you can enjoy during your stay. ... there's more to this post. Click here to keep reading! With music from our iPod playing through the pro quality speakers, the bed looking warm and inviting and the weather outside looking pretty chilly, we almost didn't want to leave for dinner! Eventually, though, we managed to drag ourselves out into the cold to the "At the Knights of Malta" Restaurant just down the street. 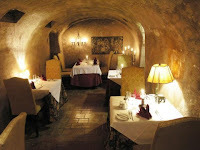 As with many restaurants in this part of town, the Knights of Malta occupy the ground floor and cellar of a house down one of Mala Strana's many narrow alleyways. Good, Czech home cooking, priced on par with most places in this tourist area (1000 CZK / $60 for two meals + drinks.) Their wild boar was fantastic and made the foray out into the cold well worth it! 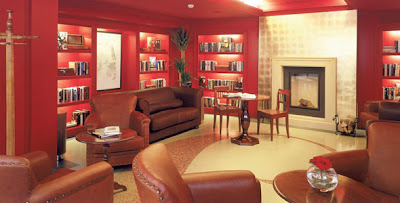 We returned to the Aria for desert - and to soak up the ambiance of the Music Salon, sinking into red leather chairs by the fireplace as a piano/saxophone duo improvised on jazz standards. Breakfast the next morning was served in the Winter Garden - a fabulous spread of breads, cheeses, meats and my favorite - French Toast, topped with whipped cream and smothered with fresh berry sauce. To make it even better - between wrestling with Tayta, and reading books with Jiddo - I don't think the kids even missed us! Merry Christmas, from the chilly cobblestoned streets of Prague! Date Night 8 - Lebanese Food! Erin's parents are in town for a Christmas visit. What does that mean (apart from new playmates for the kids to wrestle with?) - more Date Nights for Erin and I, of course! Tonight, we headed downtown to the shiny new Palladium Mall off of Republic Square (Náměstí Republiky). It's so new that Google Earth still shows it as a construction zone! The mall is currently the largest in the Czech Republic - with nearly 200 stores, close to 30 restaurants and cafes, and the foundations of a 12th century palace featured on the ground floor! As tempting as the five floors of glistening shopping opportunities were, our goal tonight was one particular corner on the top floor. Being an upscale shopping center, the Palladium doesn't have a food court. Rather, the top floor of the mall is the "Gourmet Floor" with restaurants which are kind of half-way between "real" restaurant and mall fare. And there - beneath flowing white cotton streamers, and ornate lamps, we find what we've been looking three months to find here in Prague... good hummus! The El Emir restaurant is one of the newest entries to the Prague dining scene, and let's just say it's the best Lebanese food we've ever tasted in the Czech Republic. Of course, it's also the only Lebanese food we've ever had here! Needless to say, being in Europe, our meal was a tad more spendy than a night out at the Automatic Restaurant in Muscat. But when hummus hit the table and we dipped in with fresh khubz (arabic bread), we knew we'd come to the right place! Believe it or not, it was some of the best chickpea these hummus snobs had ever tasted! We quickly progressed through the cold mezza - tabouleh salad, stuffed grape leaves, and more; to the hot mezza; to the mixed grill, topping it all off with thick turkish coffee. So - here we were, Americans speaking Arabic to a Tunisian waiter in a Lebanese Restaurant in the Czech Republic. Fantastic! Oh - by the way... if you happen to be looking for yarn or other "notions", Erin has discovered her new favorite store in Prague. Filium, on the ground floor of the mall, sells all types of yarn - and best yet - you can actually browse through it yourself - rather than having to ask the not-so-friendly counter clerk in your best Czech to pull down a skein from the shelf. Hummus and yarn - in one night! I'd call this date night a success! 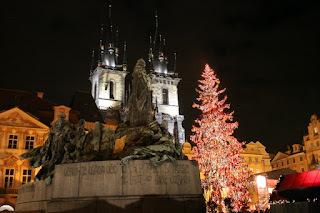 We walked right into the pages of a Christmas fairytale tonight when we stepped into Prague's Old Town Square. The twin gothic spires of the Church of Our Lady Before Tyn tower in the night sky above us, windows at the very top of the turrets orange eyes watching the scene far below. Usually, the tower dominates the square. Tonight, though, a massive tree draped in red and white lights steals the show. The square is like the Christmas Song come alive. Shoppers dressed up like Eskimos to ward off the winter chill wander through rows of decorated wooden booths topped with bright red roofs. We pick up a bag of real live chestnuts - roasted over an open fire in a corner stall. On the stage below the tree, Yuletide carols are being sung by a children's choir. The stable on the side of the square has already packed up for the day, the sheep and goats carted away to a warmer spot for the night. The aroma of roasting ham wafts through the air, pauses, then mingles with the steamy tang of a cauldren of svařák (hot wine). Pastry chefs roll out tubes of Trdelnik - a Czech pastry coasted in sugar and crushed almonds). We can't resist the crepe hut - and come away with a delicious triangle of folded pleasure - dripping in chocolate sauce. We finish our progressive dinner at the ham roastery, where the vendor cuts a hunk of ham off the spit, slaps it on the scale, and serves it up along with a hearty roll and a dollup of horseradish. ... Click here to continue reading Christmas ornaments, candles, nativity scenes, gloves, hats and wooden toys feature in crowded booths in between the food. These vendors are equipped for tourists too - "sprechen sie Deutsch? Italiano? Francais? Enlish?" they ask passing shoppers. As we pass the stage, the choir is just finishing up for the night, and amid the throngs of Christmas shoppers, just below the glistening lights of the Christmas Tree, we make a discovery. In a makeshift stable at the base of the tree lies a nativity - a silent reminder of a tiny event, so many years ago. Among the hubub of a busy census, searching desperately for shelter from the cold, a travel-wearied man supports a woman who's clearly pregnant. They've been on the road for days, making the long journey from Nazareth, 120 miles to the North. They didn't hop on the train or drive down in the family station wagon. Most likely, they walked... and walked... and walked some more. You know, I bet the booths were out in Bethlehem the night they arrived! Vendors from all over town, setting up shop to take advantage of the sudden influx of tourists registering for the census. I doubt there were any Chestnuts or Trdelnik for sale that night though... hummous and flatbread probably took the place of crepes at the food stalls in Bethlehem. All the hotels are full. Door after door displays a "no vacancies" sign. Finally, though, away from the chaos of the marketplace, the weary couple find a corner of solitude... in a stable on the outskirts of town. And none to early either! All this walking has taken its toll, and the baby just isn't going to wait any longer. A feed trough is hastily converted into a cradle... a stableboy brings in a bucket of water... and in a moment... amid the smells of an occupied barn, a stone's throw away from the crowded marketplace... a King is born. A King who ruled no lands, commanded no armies, and overthrew no occupiers. A King though, whose birth is still celebrated around the world, and even here, in what's possibly the most Athiest country in Europe... by choirs of kids, stables full of live animals, and nativity scenes in town squares. Among the hustle and bustle of the season, amidst the Christmas markets, the singing choirs, the throngs of shoppers and shelves of ornaments, take the time this week to pause... and listen. And maybe... just maybe, from the nativity in the glow of the Christmas tree, you'll hear the faint cries of the babe in the manger 2000 years ago that got all this excitement started. Chillies are hard to find in the Czech Republic. Strudel? Dumplings? Goulash? No problem - the shelves are packed with the necessary ingredients. But if you're planning to make curry, why that's something different entirely! Fortunately, a recent visit from my folks in the UAE brought us a fresh shipment of chutneys, spices and pappadams... just the things you need if you're going to put on a Curry Night in the Czech Republic. As we put the finishing touches on beef curry, brinjal salad, coconut sambal and kiri hodhi, one of our new friends, a seminary student from Andra Pradesh in India, asked me if I had ever heard of Don Rubesh. As it turns out, Don is my grandfather. "You're Don Rubesh's grandson??" Johnson exclaimed, "I can't believe I'm eating dinner in the house of Don Rubesh's grandson!" Click here to read on . . . If you're from the Indian subcontinent, it's very likely you've heard my grandfather's name. Almost half a century ago, joining forces with Back to the Bible Broadcast (one of America’s most popular Christian broadcasters) Don pulled together a team of South Asian Bible teachers, musicians, and studio technicians, and pioneered the work of Back to the Bible - Sri Lanka. Before long the Broadcast was blanketing South Asia with programming that was both Biblical and indigenous, timeless and yet culturally relative. Don was in many ways, the father of Christian radio on the Indian sub-continent. Today many of the region’s foremost Christian leaders will testify to the formative role Back to the Bible played in their spiritual growth. Johnson is one of them - having committed himself to full time Christian Ministry after listening to a sermon on Back to the Bible. He's now in Prague - studying to be a theologian, and will take that passion and knowledge back to his homeland. 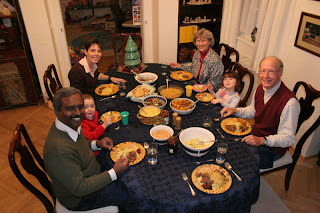 Back to the Bible has been a part of the Rubesh family for three generations - a BBB-sponsored visa is responsible for my growing up in Sri Lanka (and developing a taste for curry). If you're interested in reading more about Back to the Bible and finding out how you could invest in a ministry which has touched so many lives - including that of our new friend here in Prague, please let me know! One of Erin's life goals is to make sure the rest of her family learns how to ski. She, of course, was trained on the black runs of France... in a blizzard... with nothing but her natural athleticism and built in GPS to keep her alive. The first (and until last week last) time I went skiing was at night, under the floodlights on the icy slopes of Mt. Hood in Oregon. Not exactly powder conditions. And calling it "skiing" is a bit of an exaggeration. More like rolling/sliding/falling down the hill with skis and poles tumbling behind. So - here we are in a country with real winters... time to hit the slopes and make Erin's dream come true! With the highest peak at 1600 meters, the Czech Republic's "Giant Mountains", tucked away on the Czech Republic's northern border are not exactly gigantic compared to the nearby Alps. However, they are close, and they do have Ski Areas! We scheduled lessons for the kids and I, and hit the road bright and early Thanksgiving Morning. Grandpa and Grandma Rubesh had visited the weekend prior, so we had already filled up on turkey, stuffing and plenty of leftovers. Thanksgiving meant a day off work to head for the hills! A luxury ski resort Herlikovice is not. However, it did have the basics - a bistro selling hot dogs and hot chocolate for al fresco dining, a couple of ski lifts, and some good instructors - who spoke English! Suiting and booting four while keeping a baby happy is not a relaxing experience. However, 8 boots, 8 skis and 8 ski poles (the kid's favorite accessory) later, we headed toward the ski school. As it turns out, we had rented equipment from the spot closest to parking, but farthest from the ski area proper... fortunately, Kyler's new winter-hardy stroller has a bit of cargo space! First lesson at ski school? How to stretch your muscles. After a quick snack on the slopes, we found our instructors. Jad and Danna did great - they were slipping, sliding and laughing like crazy in no time flat! I had a private lesson on the finer points of a snowplow turn and important things like how to stop (without falling down - which was my previous method of stopping). At the end of our hour of on-snow training, Kyler was still fast asleep in his stroller, and Erin took to the slopes. Two kids suited in about 5 layers of clothing, baby sleeping in the stroller, wife off skiing. What's the one phrase you're really not looking forward to hearing? "Daddy, I have to go Pee Pee!" Off we tromped to the decidedly communist "Hotel Eden" - dark dingy corridors, aging carpet and peeling paint. Fortunately, we quickly found the communal toilets, and were pleasantly surprised to find out that each stall came complete with free toilet paper! 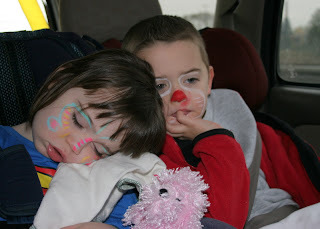 Appropriately relieved, the kids settled down to a DVD in the back of the 4Runner while I built a snowman and Kyler snoozed. Did we have a good time? I'll let you decide - check out the following videos before voting! You don't often come across a statue of a saint sitting on the belly of a decidedly dead horse. Believe it or not, that's exactly what hangs from the ceiling in the lobby of the Lucerna Palace Cinema, just off Wenceslas Square. Having opened in 1909, the cinema boasts being the oldest operating cinema in Europe. The single screen theater, seating 500, is truly stunning. Until the velvet curtain opened and the Dolby Digital Surround Sound kicked in, you could almost believe that you'd been magically transported back in time to 1929, when "Show Boat", the first "talkie" movie premiered here. We made ourselves comfy, settled down and spent a couple hours learning about the life of Jane Austen in "Becoming Jane". I thought the movie flowed a little like a Jane Austin novel... introduce a slew of characters speaking thickly-accented English (no - the Czech subtitles did not help) through a very slow opening 30 minutes or so, and then spend the rest of the movie figuring out who was who and what they were up to. Not a bad way to spend a date night though - and this was the first movie we've gone out to see since this summer in Oklahoma City. Tickets were 120 CZK / US$7, but there was no popcorn... so we had to settle for sneaking in a Bratwurst from the corner hot dog stand! We rounded the night off with a visit to TGI Friday's for a good, American style hamburger. Delicious, messy, and well worth the trip! We'll have to remember to bring our own drinks in next time though - the 1/4 liter bottles of water just didn't do justice to the thirst worked up by a sausage and a Jane Austen movie. Free refills? Forget it! So - we were eating our breakfast this morning in the kitchen, when we looked up from our BamBam Pebbles and Dinosaur Oatmeal and noticed something different... something white... something fluffy coming down from the sky. 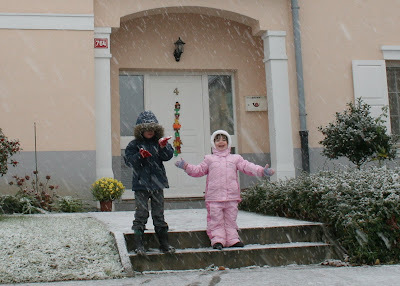 Yep - it was SNOW! Real, big, fluffy, white flakes of SNOW! Excitement mounted as it began to stick to the ground outside. First question? "What does it taste like, Daddy?" I was in the middle of trying to explain that it was a bit like fluffy ice cream when I figured the best way to answer the question would be to get them some to try. So - out to the back yard I tromped in my stylish green bathrobe and flip-flops to grab them each a couple spoons of fresh snow. Nothing like snow to complete a tasty breakfast! We gobbled down our breakfast, threw on some "snow clothes" and headed outside. Jad now knows how to make snowballs and throw them at his Daddy. Danna specialized in tasting snow... snow from the sky, snow off the grass, snow off the driveway... you get the idea. Fun stuff! Unfortunately (for us snow-lovers), the snow had been rained away by the time we headed out to church, but this bodes well for a snowy winter! 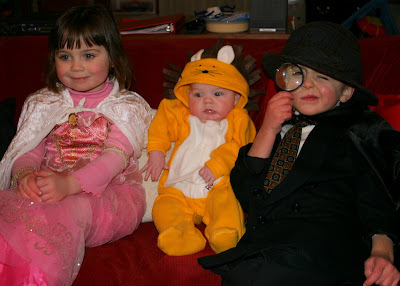 What do you get when you cross a pretty princess, a handsome detective and a cute lion? A recipe for a fun night of Trick or Treating, that's what! Halloween night at our Mala Sarka housing development has become famous in Prague. Somehow the word got out that if you dress up in a costume, learn a couple funny english words "Trick or Treat", and knock on doors, those funny Americans will actually give you candy... for free! Tonight was Jad (Sherlock Holmes) and Danna's (Princess "Leia") first experience with "real" trick or treating. In Oman, the international school put on an annual festival, with trick or treating at each classroom door. The concept of being outside and running from house to house was a new one. While we filled our bags with a wide assortment of sugar products, Erin and Kyler stayed home to feed the teeming masses from our own stash of candy. Candy bags bulging, noses running, and fingers freezing, we returned home to count our treats and plan how to trick Mommy into letting us eat them! Tonight was one of those "rapidly planned" date nights. In other words, as our babysitter arrived, we were still discussing where we'd like to go. Mexican food sounded good, so we called up a friend and got the name and address of a good Mexican restaurant. A quick lookup on Google Maps pointed us in the right direction, and we headed downtown. 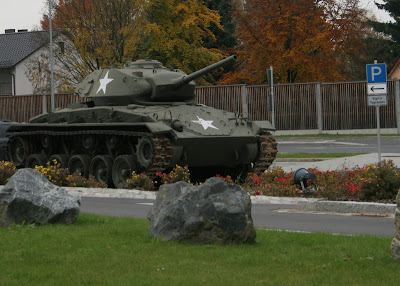 It was a chilly night, but we liked the idea of free parking at the Embassy and a stroll down Ujezd to number 38. Nothing could be easier, right? Wrong! Number 45... 41... 39... 37... eh? We checked the other side of the street - nothing there remotely Mexican looking! Number 38 was just not there! Visions of salsa still dancing on our brains, we hunted for a couple more minutes before deciding to head to the Funicular that runs up to the top of Petrin Park. The station looked deserted, and sure enough, we'd struck out twice in 10 minutes due to an annual maintenance closure. Imagine that - our most hastily-laid plans coming awry! Walking down the hill back to Ujezd, we crossed the street and headed North back toward the Embassy... and found (you guessed it), the Cantina Restaurant, in all its glory, at number 38. Number 38, which was right across the street from Number 19 (of course). So - important lesson learned. Though the odd and even numbers are, in fact, sequential along the length of the street, the two sides are not necessarily in sync! Restaurant found, we settled in at the bar ("rapid planning" also means no seats) and enjoyed a GREAT meal. Good food, at decent prices - and at the address it was supposed to be! A quick stop for desert at Caffeteria Coffee in the shadow of Prague Castle, and we headed home for the night, mission accomplished!